We don’t all have a green thumb, but most of us have seen those drool-worthy shots on Instagram that feature adorable succulents and fiddle leaf figs, and wondered how we could tend our own plants! As you are preparing to leave the nest for the first time (heading to college), you might want to start caring for your very own little plant families, and so, we wanted to give you our best tips. 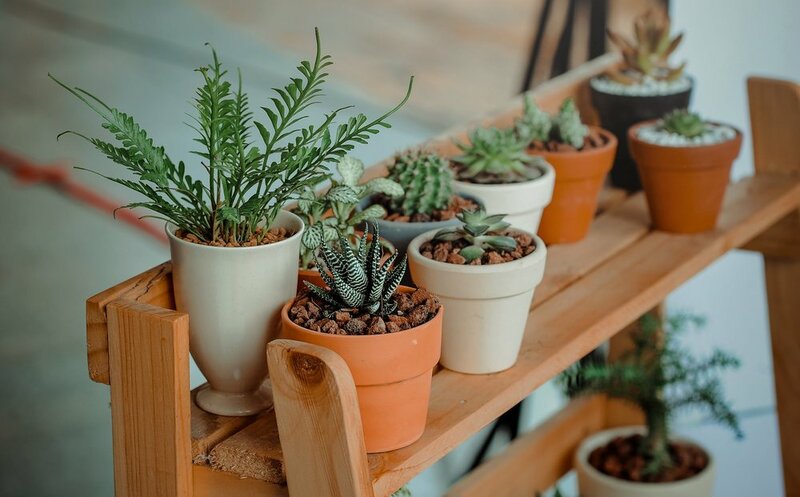 -Choose the best plants for your room or home: Some plants like cactus and succulents need constant sunlight, which will make them tricky to grow somewhere like a dorm room, so look for plants that match where you plan to enjoy them. If you have a lot of natural light in your apartment or room, you will be able to situate them in the perfect spots. The creeping fig and philodendron are two that don’t require much sun, and still give you the beauty of having indoor plants. -Figure out how much water your plants need: One of the most common causes for plants to die is too much or not enough water. Each species of plant need certain amounts of water, so it’s good to figure that out before soaking your little pots. Soil should be moist, not saturated or dry. Watch for yellow leaves or browning on the edges of your plant as signs of it drying out. -If you leave, ask someone to check on your plants: If you have a roommate or friend, ask them to look in on your plants and water/open the blinds if they can. That way, you won’t risk coming home from vacation to a bunch of sad and dead plants. Be sure to leave instructions if they are particularly finicky plants that need certain care, and employ a moisture probe if you are curious how much water your potted plants need. -Water with your leftover cooking water: It sounds silly, but come leftover cooking water, such as that used to cook veggies or hard boiled eggs, can be filled with nutrients for your growing greenery. It also is a great way to use up water that would otherwise be tossed out. -Watch the temperature: Your thermostat matters. If you’re sharing a dorm room, it may be tricky to come to an agreement on the heat or cooling systems, but remember that it does affect the moisture of each plant for it to be too hot or too cool. Look online for your certain plant species, to see if your types need a certain temperature range, and then aim for that when you set your thermostat. Also, remember that indoor plants help clean the air, so they are good for you as well as pretty to look at!